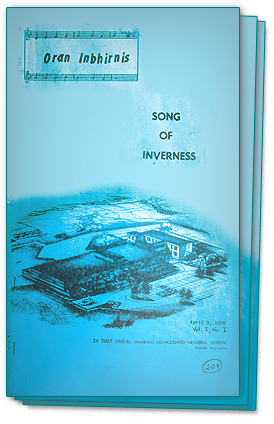 Inverness Oran's First Edition - 1976The Inverness Oran was born in the spring of 1976 when five young people, including a priest, felt that Inverness County needed a communication vehicle all its own. Eleanor and Rankin MacDonald, Lawrence and Jackie Ryan and Father Bob Neville(deceased) were also hoping to create jobs that would keep them at home. With the help of a solid group of volunteers, the first issue appeared on the streets on April 9th, 1976. It was an 8.5x14 inch creation with a blue cover and became known as "The Blue Book". It was created on a copier supplied free of charge by Stella Maris Parish. Lawrence and Jackie Ryan left after a year to pursue other interests but The Oran was fortunate to pick up a free agent, Frank Macdonald, who supplied our first column, Frank Macdonald’s Comment, and who joined Rankin and Eleanor as the owners for the many years that lay ahead. The Oran adopted the newsprint version in the fall of 1978. The Oran has been extremely fortunate to be able to attract excellent staff and columnists and has served the people of Inverness County by telling its stories and promoting its way of life. Frank has retired but has gained even more fame as an award winning author and Rankin and Eleanor are still putting The Oran to bed each week. Today The Oran employs 12 people as well as columnists and those who help get it into the homes. Without the loyalty of its readers The Oran would not have survived for four decades and Eleanor, Frank, Rankin and the rest of The Oran family will always be grateful to the people who buy it every week from their paper carrier, their newsstand or by subscription. Oran is the Gaelic word for song and we can only hope that we have sung the songs of Inverness County well for the many years we have been together.